EDITORS: This monthly tip sheet is based on Indiana University faculty research, teaching and service. "Living Well Through Healthy Lifestyles" is the guiding philosophy of IU Bloomington's School of Health, Physical Education and Recreation. In keeping with that philosophy, this tipsheet offers information related to both physical and mental well-being. Faculty in other IU schools and departments also contribute their expertise in this area. September's tips discuss balance exercises that can be performed at home, a family television viewing strategy and the benefits of cooking your own food. 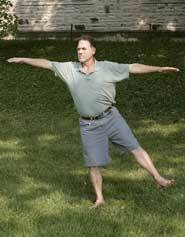 Pictured is one of three basic balance poses practiced at home by study participants. Anyone who has had a stroke or has an existing gait problem or diabetes should discuss the poses with his or her physician. Study participants were fairly fit to begin with. The research was geared toward helping people with their balance before it becomes problematic. Click here, http://newsinfo.iu.edu/news/page/normal/2418.html , for detailed directions for the three poses. Before and after the six-week balance regimen, researchers carefully measured the participants balancing abilities, including sway patterns, and found that the speed at which the participants swayed actually increased by the end of the six-week study -- and this is a good thing. Doctoral student Koichi Kitano said the increased velocity of the participants' sway patterns increased their stability. David Koceja, a professor in IU Bloomington's Department of Kinesiology, said sway patterns change as people age. For senior citizens, their sway patterns are likely to be more circular. Koceja said he expected the balance poses in the study to reduce the amount of the troublesome side to side sway in study participants. Instead, the participants saw an average increase, or improvement, in their sway speed of 16 percent. "We took the balance system and instead of being more sluggish, it became more flexible and adaptive," Koceja said. For more information, contact Janet P. Wallace at 812-855-6384 or wallacej@indiana.edu; Julie Frey at 812-855-7556 or jufrey@indiana.edu; and David Koceja, 812-855-7302 or koceja@indiana.edu. One way to "interrupt" the connection between children and television is to bring a family focus back into the equation. Watching TV together can promote healthier television consumption for children, said Maresa Murray, an assistant professor in the Human Development/Family Studies program in Indiana University Bloomington's Department of Applied Health Science. She noted that in 2003, Nielson Media Research estimated that U.S. family households watched an average of eight hours of television per day, while 57 percent of children in the United States between ages 8-16 have a television set in their bedroom (Media in the Home 2000, Annenberg Public Policy Center). Current research from Indiana University and the American Medical Association has shown relationships between TV viewing and both adolescent obesity and lower standardized test scores. Implement your own unique family rating system. Make use of the Television Parental Guidelines Rating System and the ability to block television programs not meant for your children to watch (http://www.fcc.gov/cgb/consumerfacts/vchip.html). Have fun creating your own unique family guidelines. Think outside the traditional channels. Try not to forget the wide array of program options with "family friendly" subject matter such as animal behavior and home safety design. Children's programming should be monitored to make sure it's appropriate for your children's ages and void of stereotypical depictions of ethnic groups and gender roles. Hit the mute button during commercials and talk with your kids! The time allotted for commercials can help keep the conversation light and short, but very significant. Television programs can be very useful in prompting social communication for families in a non-threatening way. Discuss the show's topic. Finding out what children think about the storyline may not be specifically relevant to their lives at the moment, but the discussion may yield some pertinent pieces of advice for them later. Include children in appropriate world news events. Television for children seems to include mostly entertainment. Building a sense of connection to the larger world context not only promotes social awareness, but also helps children integrate their understanding of classes such as social studies and history. "That reminds me of your grandmother, when she..." Use world news stories to build family oral histories. Many ethnic groups favor the use of oral tradition as a way of passing along a sense of family history through sharing stories. One way to implement this tradition is to use a television program/news event as a talking point to share a story of an extended family member, including cousins, great aunts and uncles, grandparents and great grandparents. Using this approach gives the child a sense of historical family context in relation to a relevant event in their own life. Sharing stories of family history in this manner can create a sense of connection and pride for each family member and create a sense of anticipation to hear more about the family. Murray can be contacted at 812-856-5213 and marjmurr@indiana.edu. Fighting weight gain? Reach for your pots and pans. "When people rely on highly processed, ready-to-eat foods, they give up control of what they are eating," said Victoria Getty, director of the Didactic Program in Dietetics at Indiana University Bloomington. "Prepared foods have more sweeteners, sodium and calories than most people would use when cooking from scratch." Getty said that many students arrive at college with few cooking skills aside from how to use a microwave. This puts them at a disadvantage in terms of their weight and their health. "The first time I taught a class involving food preparation, I set the students up at separate stovetop stations and asked them to melt a pat of margarine. All of a sudden there was a giant line in one end of the room. I had to go over and ask what was happening before I realized they were all in line for the microwave." Getty said that once students learned how easy it was to melt margarine in a pan on the stove, they became more confident and more interested in simple cooking techniques. "It's easy to learn a few basic skills in the kitchen," she said. "Once you know how to prepare fresh foods, you have many more choices available to design a healthful diet that is under your control." The Didactic Program in Dietetics is in the Department of Applied Health Science in IUB's School of Health, Physical Education and Recreation. Getty can be contacted at 812-855-3936 and vgetty@indiana.edu. For assistance with these tips, contact Tracy James, IU Media Relations, 812-855-0084 and traljame@indiana.edu, or Elisabeth Andrews, 812-856-3717 and ecandrew@indiana.edu.